with protecting the marchers but were met with strong resistance from several anti-fascist groups including local Jewish groups and trade unions. The protesters built barricades to try and stop the march and far outnumbered the people marching. Mosely eventually had to cancel the march. Rioting between the anti-fascists and the police continued however, and many people were arrested. 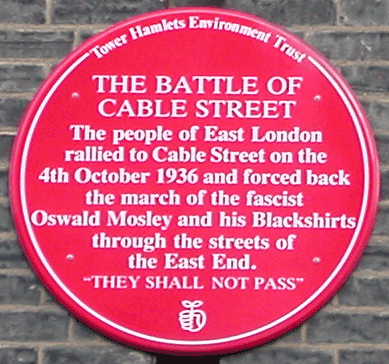 This event is often remembered as a decisive moment where British fascism was defeated. Street. The photograph was taken on 17 September 2005.